Design a curriculum for volunteer community members to teach physical fitness to SNAP ED participants. 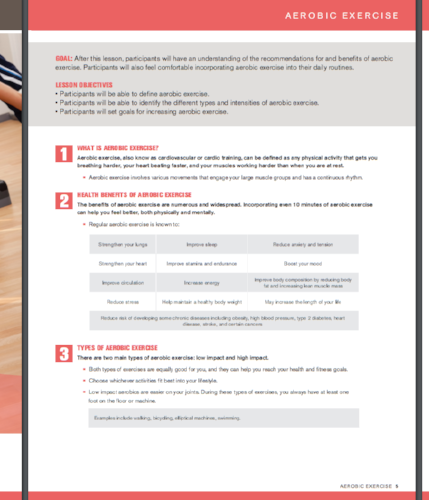 Create an Active Lifestyle—Is a manual to act as a resource, reference, and lesson plan for volunteers to teach physical fitness. The final book is about 100 pages long with 20 lessons. Many food stamps recipients do not know how to stay physically fit. In addition, they lack money for exercise equipment or a gym membership. I was tasked to develop a physical fitness curriculum for Food$ense educators to help them teach food stamp recipients ways to become physically fit and active without adding any financial burden to them or their families (for instance, having a gym membership, hiring a personal trainer, buying sports equipment, and so forth). The goal was design a creative and intuitive training program that was easy for anyone to follow or teach. I was interested in doing this project because I believed helping people learn how to be physically fit would improve the quality of their lives. I also enjoyed the challenge of finding a way to teach exercise principles simply and clearly. Since I was a certified physical trainer, I was well versed in the principles of exercise science. I read other physical exercise curriculums to see others’ designs and methods and to analyze how they could be adapted to meet the needs of people who could not afford exercise equipment. Designing a curriculum to help non-professional, volunteer educators understand and teach the components of physical activity and fitness (despite their having little to no previous exposure to the principles of exercise science) was the most difficult aspect of the project for me. How could I present the material in a way that could be easily understood and taught? Trying to put myself in their shoes, I wrote, organized, and compiled most of the material. This project was the second curriculum program I worked on. However, I found it to be just as rigorous as the first, requiring multiple iterations and consultation with exercise science professors and students so that the manual could facilitate a quality education. Their feedback helped me to simplify the concepts and make the manual easy to use. I worked with the graphic and marketing designers to develop the artwork and design the organization for the material. While most of the ideas were mine, their insight and assistance in designing the flow of information and final composition of the book increased the professional look and feel of the product. The design and content reviews with professors and the marketing team constituted the longest part of the project. These iterations improved the content and clarity of the curriculum but, more importantly to me, taught me that creativity requires review and improvement to truly make a polished product that is easy to use and valuable for the intended user group.